“Lydia is dead. But they don’t know this yet.” So begins this exquisite novel about a Chinese American family living in 1970s small-town Ohio. Lydia is the favorite child of Marilyn and James Lee, and her parents are determined that she will fulfill the dreams they were unable to pursue. But when Lydia’s body is found in the local lake, the delicate balancing act that has been keeping the Lee family together is destroyed, tumbling them into chaos. A profoundly moving story of family, secrets, and longing, Everything I Never Told You is both a gripping page-turner and a sensitive family portrait, uncovering the ways in which mothers and daughters, fathers and sons, and husbands and wives struggle, all their lives, to understand one another. 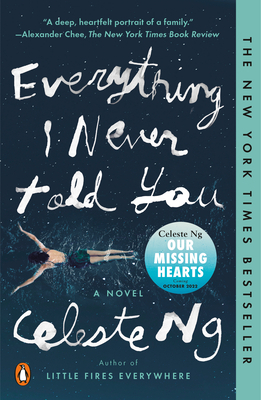 CELESTE NG grew up in Pittsburgh, Pennsylvania, and Shaker Heights, Ohio. She attended Harvard University and earned an MFA from the University of Michigan. She lives in Cambridge, Massachusetts, with her husband and son. She is the author of Everything I Never Told You and Little Fires Everywhere.